Today we’d like to introduce you to Rob and Katherine Douglass. Thirteen years ago, Rob Douglass had a vision to open a company that would create outdoor living spaces that would be as functional and as attractive as the inside of the home. Something that looked original to the home and not an add on. Initially, Texas Custom Patios built simple decks and pergolas, but the market was changing and the timing was perfect. Along with his wife, Katherine Douglass, and business partner, Steven Schell, Texas Custom Patios began building luxury outdoor living spaces complete with fully equipped kitchens, outdoor living rooms, outdoor fire features, entertainment centers, and specialized dining areas. The first full year in business, 2005, there were 44 projects completed … now, an average of 200 projects are completed each year. This includes the newly opened branch in the Dallas Fort Worth area. In order to grow to this level, Texas Custom Patios needed to develop crews from all the trades that are required to build the projects. They have sub-contractors that have worked with them for many years – framers, electricians, painters, masons, plumbers and more. Texas Custom Patios has 7 project developers in the Houston area and 4 in the Dallas Fort Worth area that work closely with each homeowner throughout the process of designing and building the dream outdoor living space. The road has been relatively smooth, although with any business there are always some struggles. When Hurricane Ike hit the area, there was a definite slump in business. Everyone was focused on repairing damaged homes – not just theirs but others that were less fortunate. Homeowners took the time to help out in the community and put their own backyard dreams to the side for a while. The recent oil slump has had an effect as well – homeowners have taken precautions with their spending. We have noticed an increase in sales since the beginning of 2017, which falls in line with the economy getting stronger again. Texas Custom Patios – what should we know? What do you guys do best? What sets you apart from the competition? Texas Custom Patios has several unique assets that stand out from all the other patio competitors. Their key to success is designing and building a structure that does not look like an add-on, it looks original to the home’s design. No matter how old the house is, roofing, bricking, siding is all selected to blend with the structure of the home. It can be a challenge sometimes to figure out how to tie in substantial additions while maintaining the style of the original home, but we achieve success time after time. We focus only on outdoor living – we are not interior remodelers. 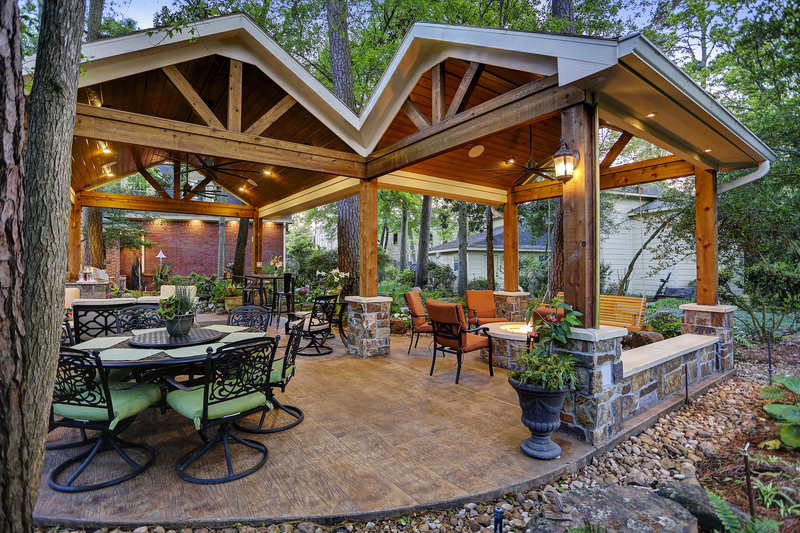 There are many types of projects we build – patio covers, pergolas, screened porches, pool houses, room additions, outdoor kitchens, outdoor fire features, decorative patios, and more. When we work with a customer on their backyard design, we gather information and create a project within their budget. We offer suggestions on design and finishes to make the project a custom space for the homeowner to enjoy. The project developer works with the homeowner from start of design to completion of the project… the project is not handed off to anyone else. Texas Custom Patios also has a strong written warranty. Success is defined when we have happy homeowners. Knowing we are building and creating their dream outdoor space is something we take seriously. When at the end of the project, we are told it was exactly what they imagined or it turned out better than what they thought, that is success. We are always looking to have satisfied homeowners – ones that will and do refer us to their friends and neighbors. For more from VoyageHouston, click here!